Is your android device is out of space ? Means you can't download and install any more apps from google play or do you want to work around country restriction ? Then you can simply download APK files from Google play to your computer and install it on your device later. In this way you can also store a huge collection of APK files in your computer hard drive or on cloud and later whenever you required the app, you can simply take it and install it on your device. Here's how to download APKs to your PC. There are couple of ways to download a Google play APK to your PC. You can use a chrome extension, you can use Mozilla Firefox add-one or you can also use a website which can generate a specified download link for you. We have covered all 3 methods in this post. You can also download paid Google play APKs if you have already purchased them on the play store. P.S Don't forget to read Google play's terms and conditions at the bottom of this post. If you wanted to download lots of APKs from google play then getting yourself an extension from chrome or Firefox is probably a good idea. For this tutorial we are using CodeKiem's APK downloader extension version 2, which supports both chrome and Firefox browser. Look at the snap shot above about how does it looks. You have to click on "Add to Firefox" button if you're using Firefox browser else you can click "Add to chrome" button. Once you have added chrome/Firefox extension on your desktop browser, you need to add your google play email address in this extension. After that you need to enter your device ID too for later requests. Note :- If you don't know your device ID just like me then you can use "Device ID" android app to get one. Once you have performed all the steps successfully, Go to Google play store then find the app you wanted to download to your PC. Now you will notice next to "Install" or "Buy" button, there is "Download APK" option. Simply click on that button to download the app. Wasn't it was easy to download apk files from google play via chrome or Firefox extension's ? Do write your feedback in the comments below. Now lets see the another simple method to download apk files by using online website. If you're more casual APK downloader then chrome or Firefox is probably not a good option. Instead you can just visit a online dedicated apk download site. Just follow the simple steps mentioned below. Step 1 :- Go to Google play store and find the app you wanted to download. Step 2 :- Copy the URL of the app. 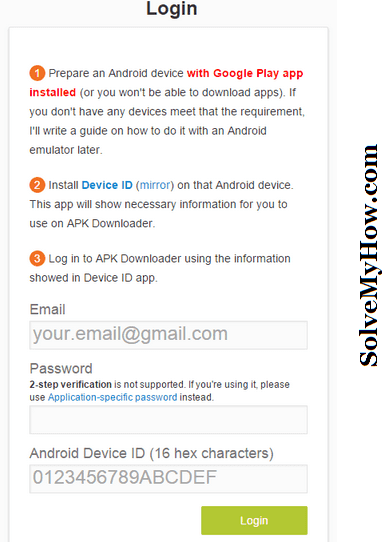 Step 3 :- Now visit Evozi APK downloader (https://apps.evozi.com/apk-downloader/). 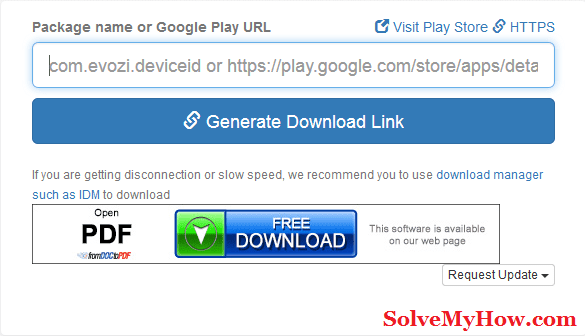 Step 4 :- Simply paste the whole URL of the app and click on "Generate Download Link" button. Step 5 :- Download the APK and later install it either on your tablet or phone. So this was all about how to download apk from google play. I hope you found this tutorial worth reading and helpful. Please do read the below mentioned Google play terms about downloading the APKs. We just wanted to let you know that downloading apps directly from google play store may technically be against of Google play store's terms (we are not entirely sure about it). So use this process at your own risk. So do you like to download APKs to your PC for backup ? Do let us know in the comments below. You can also subscribe for SolveMyHow newsletter to get instant updates about android.